Ubud is well-known these days, especially since the film Eat Pray Love brought thousands of people looking for themselves through healing, yoga and alternative lifestyles. 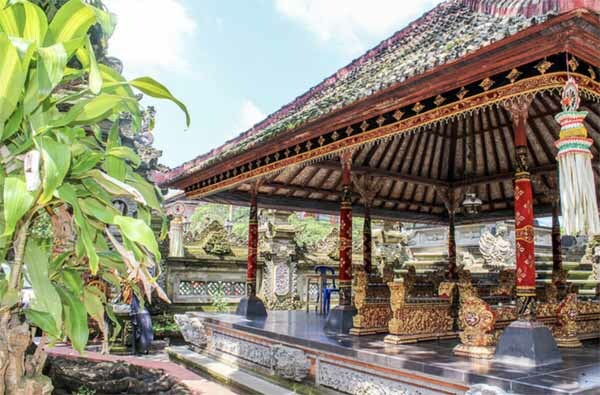 Those who love the arts, literature and healthy living had, of course, already discovered the joys of Ubud and it is still a rich, vibrant and cultural centre to visit or to live surrounded on all sides by rice paddies, glorious vistas and pretty villages. There is always lots to do and see, so you’ll never get bored living in Ubud. Known as the artist’s village, Ubud is full of painters selling traditional Balinese art as well as more modern works. There are galleries everywhere, as well as the Ubud Art Market. One of my greatest pleasures is wandering around the major art museums, the Neka, the Agung Rai Museum of Art, the Museum Rudana and celebrating the ‘Dali of Bali’ at the Antonio Blanco Museum. Here you will find the best of Balinese art over the last couple of centuries and they are a quiet, cool haven away from the busy streets. I love the shopping in Ubud. There are lots and lots of little boutiques for fashion with clothes that you don’t see anywhere else. You will find hand-crafted jewellery, gorgeous textiles and one-off designer garments. 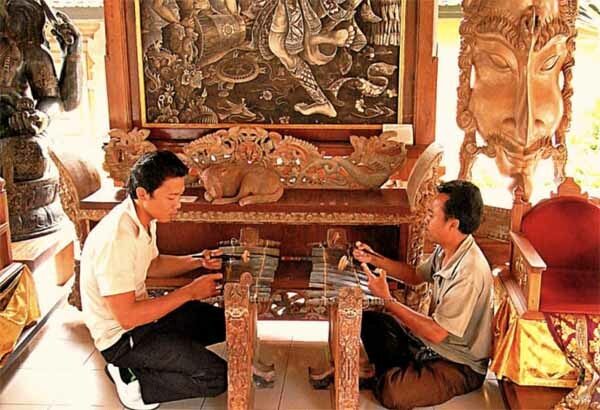 Ubud is surrounded by villages which each have their own tradition of crafts, either wood carving, stone carving, painting or jewellery making, so there are many of these crafts and paintings available. 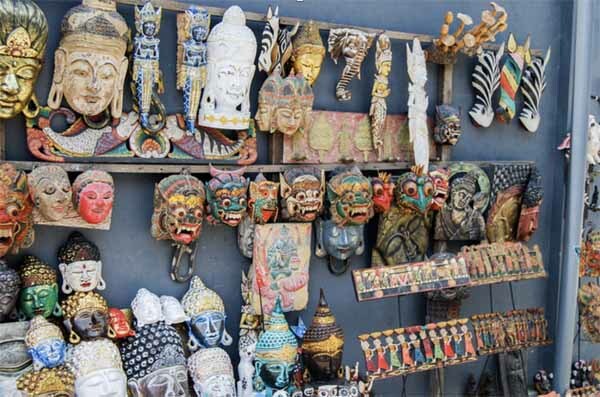 The town is also a magnet for those who have an artistic or design flair, so there are the best homewares, art-works and ceramics that you can find in Bali. A long walk around the main streets of Monkey Forest Road and Jl. Hanoman will bring you past the majority of the shops. Ubud is a culinary heaven for those who like Balinese food. There is a food festival in April each year where you can enjoy tastings, cooking demonstrations and workshops. But you can do cooking classes all the year round at the many cooking schools around the town. Some of the most well-known are at Casa Luna and Bumi Bali and you can also find specialised classes such as vegetarian or raw food—there is even one at an organic farm. There is probably more yoga going on in Ubud than anywhere outside India. The Yoga Barn is possibly the most well-known and they have classes all day long, seven days a week. There are many other smaller studios so you are bound to find one near you. There are also retreats of all kinds and teacher training sessions available. 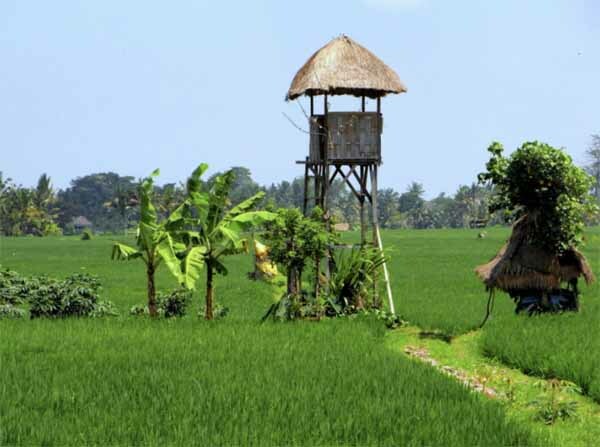 The areas surrounding Ubud have some of the best scenery on the island, with beautiful views of Mount Agung and spectacular, terraced rice paddies. 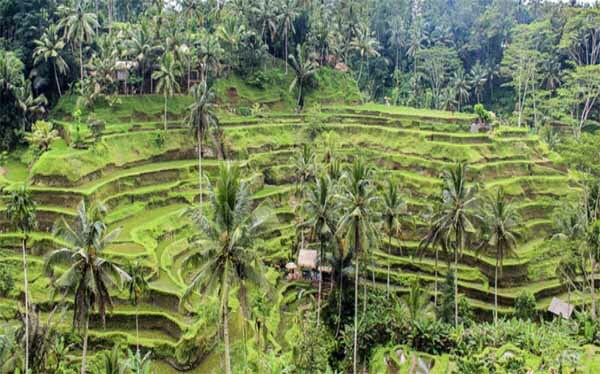 Travelling north from the village, you will find the incredibly pretty Tegalalang rice terraces. You can sit on the verandah of a restaurant there and admire some of the most famous rice terrace views in the world while having a tasty lunch. If you go west to Mengwi, you’ll come across the beautiful temple Taman Ayun surrounded by its shimmering lake. Closer into town is one of my favourites, the Campuhan Ridge walk, which gives you some of the prettiest views of Ubud. One day I set off early in the morning along the path edged with long lush green grass above the ravine. After a short while I saw a man at the top of a coconut tree on the other side of the ridge. Literally moments later, he appeared in front of me. Up close he was elderly, tiny and full of wiry strength. It was hard to believe he had climbed the tree, let alone got from there to me in a matter of a couple of minutes. He offered me a coconut to drink which was extremely welcome in return for a few coins which he said was to buy coffee. Another special memory of Bali to add to the collection!